An unremarkable example of an unremarkable card featuring an unremarkable player. Probably a VG-EX, and most certainly a common card. The trivia answer is rubbed off, so you can plainly see that it was in fact Whitey Ford who threw 32 consecutive scoreless innings in the World Series. Which is true. He also threw 33 consecutive scoreless World Series frames, but since 32 is a smaller number then Topps is technically right here. The discrepancy comes from the fact that Ford followed up his 18 shutout innings in 1960 and 14 shutout innings in 1961 with a single scoreless inning to start the 1962 Series, which Topps didn’t take into account for this question. 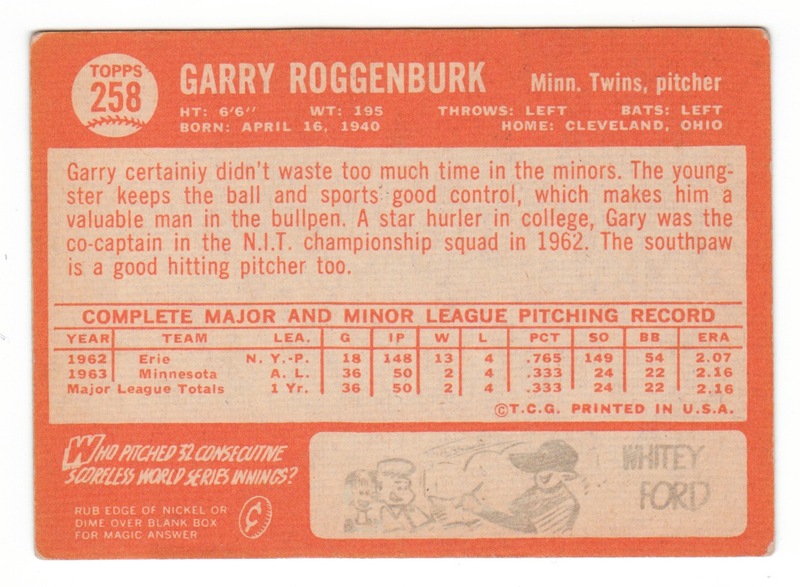 Garry Roggenburk was a promising young lefty out of the bullpen for the Twins who had a nice rookie year in 1963. His ERA of 2.16 in 50 relief innings was impressive, though his FIP registered at a much less impressive 3.92 (due to bad walk and strikeout numbers). But still, he looked to be a part of the Twins staff going forward. And even if baseball didn’t work out, Roggenburk was a standout basketball player in college for Dayton and led the Flyers to the 1962 NIT title. He was even drafted by the Golden State Warriors (well, San Francisco back then). But then, just before the ’64 season, he underwent elbow surgery and missed the entire year (but he would be featured on this card anyway). When he returned, he never re-established his footing in the majors. 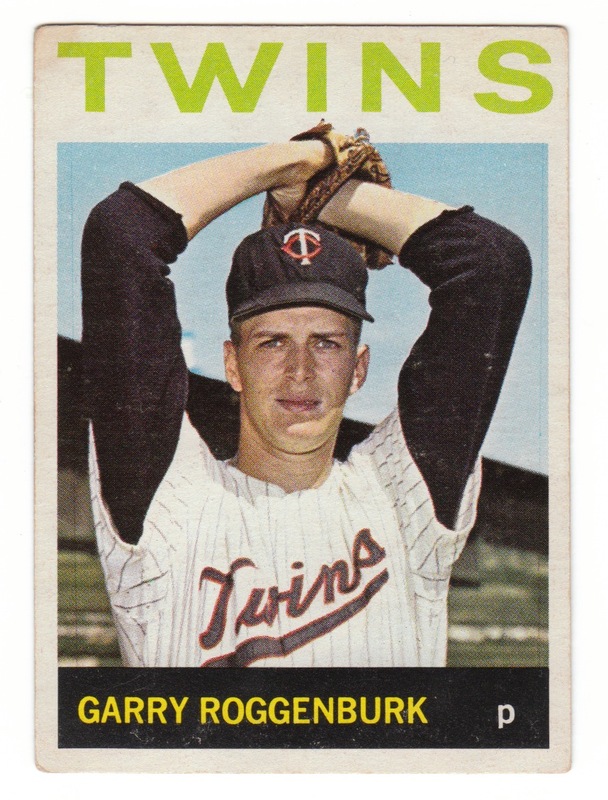 After 21 ho-hum innings in 1965 and 12.1 bad innings in 1966, the Twins sold him to the Red Sox. In three-plus seasons in Boston, he threw just more than 18 total innings in the bigs. He ended his career as a Seattle Pilot in 1969, where he started four games and posted a 4.44 ERA in 24.1 innings. He was just 29 years old when he bowed out. For his career, he was 6-9 with an OK 3.64 ERA and not-so-OK 1.56 WHIP in 126 innings. Despite being with pennant winners in 1965 (Minnesota) and 1967 (Boston), he never appeared in a postseason game. After retirement, he worked for many years in the Red Sox organization. He’s now 69 years old.